Bart Jansen, aged 37 from The Netherlands, has a hobby most people would consider weird. He has dedicated his spare time to turn dead animals into drones or remote controlled vehicles. He is famous for the dead cat drone invention. Something tragic happened to Jansen’s cat. His cat Orville got hit by a car, and it died. Jansen decided to develop a drone using the dead cat’s body instead of burying it. He drew his inspiration from one of the Wright brothers who invented the airplane. 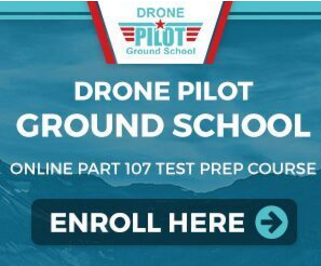 He rutted Orville’s body preserved it and made him into a custom quadcopter. Jansen did not do it alone. He sought the help of Arjen Beltman, an engineer, who helped him fly his creation. His custom creation has made headlines and now he has some more animals to show you. Thought the dead cat drone was the last of the creepiest inventions? Think again! 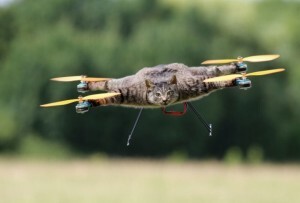 After Jansen and Arjen successfully turned a cat into a quadcopter, several other projects followed and now they own Copter Company, is a Netherlands based company that produces a wide range of taxidermy animal drones. It is not a Nazi weapon that was used in World War II. 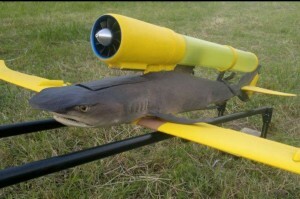 Meet the taxidermy shark jet. It resembles the V-1 flying bomb. It may not be the weirdest weapon to be invented but it still scary. Who thought rat could fly? 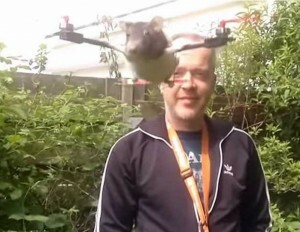 With the existence of a cat drone, the idea a rat drone is welcome. 13year old Peppjin donated the rat for the experiment after it died from cancer. It was the first invention made by Jansen after his killed was killed. The idea gave birth to other creepy ideas. Jansen and Arjen turned a flightless bird into a flying one. It was first flown in July 2013.It took a lot of power to get the ostrich off the ground. The interesting aspect of the project is that the animal drone inventors used animals that have killed on the road to make the strange quadcopters. All you need to do is bring a dead animal, and they will make it fly. Is it possible to develop cheap drones from toy cats? Yes. It is a possible venture. However, it would not be ideal for indoors flying as it will break things in the house. It sure would be a pretty cool and remote controlled birdie. What are the measurements of the ostrich-copter? 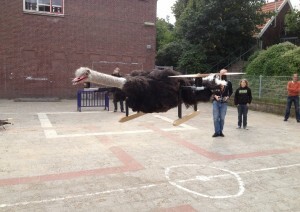 The Ostrich Copter is a creation of Bart Jansen and his engineer friend. The ostrich died of a disease. The ostrich carcass measured approximately 3 meters long and weighed 46 pounds (21 kilograms). His idea for the Ostrich Copter was inspired by an invite to the Zwarte Cross Festival in the Netherlands. He says he thought it was funny to fly a bird that would not fly in real life. Are there any other strange and creepy flying animal inventions from the two? Yes. Nothing seems to control their obsessions with road kill animals. The current project involves a hedgehog. The death of Jansen’s cat gave birth to a hobby and now a company most people may consider peculiar. While most of us are used to unmanned air crafts, dead animals have taken the center stage. Turning dead animals to flying machines may not be a welcome idea to animal lovers. Why not bury the dead animals and leave them in peace? 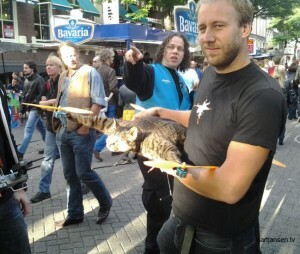 However, according to Jansen and Arjen, they see no harm using the dead animals. The next time you see a flying ostrich, do not panic. This is freaky, crazy and funny all at the same time!! For some reason i am not surprised when i see cats fly like that lol. But still i wouldn’t do that to my pet. You know what would be scarier? A Bat!